Georgia Southern has finally succumbed to a truth Panther fans had known all along: We are the real GSU. Earlier this month the Eagles athletic department sent out an email with info about alternate logos and changes to the school’s acronym, according to SB Nation. 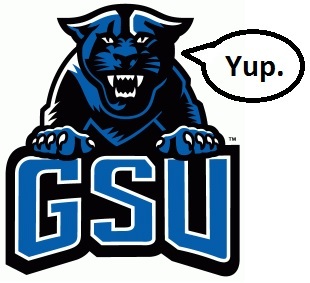 GS’ athletics department said the university’s teams have been closer affiliated with GS, rather than GSU, for years, as Georgia State repped the title first.